My job as supervisor. . .
Today the window guys arrived right on time. 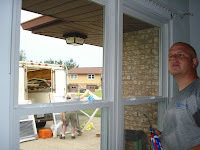 . . 9 a.m. We are having all new replacement windows put into a duplex. Ten windows, then they will wrap all the sashes on those and the sliding glass door, so there is never any trim to paint. Yay!!!!! They will have all the windows in by 10:30 and be done by 1 p.m. This is the second duplex we've had done. They did one last year for us and we are so pleased with the results. The tenants are very happy with the windows and they aren't drafty like the old ones. If you are going to have rentals and keep good tenants, you must maintain your properties and that is what we strive to do. This is the same duplex we had to replace the roof on this year. Ouch! We had not planned that expense, as the roof was only 8 years old. Terry's mother had it put on and without someone supervising the work, there were some things done incorrectly. As a result, the heavy snows here this past winter created a terrific snowload on the roof. Some decking had been run incorrectly and some rafter repair done haphazardly; and, as a result, we had a swag in the roof. Probably would have been devastating if we have another winter like last, so we made the decision to replace the entire roof. It is a good thing we did, because it was poorly done underneath. It is now repaired properly and will last 30+ years. This duplex has gotten all the attention this year. We just had a central air unit go out on the one side and the bad news is it must be completely replaced. . . there is no fixing it. But the unit there lasted 30 years. We do have a yearly maintenance we do on the heating/AC systems, so that has no doubt increased the longevity. Our window guy cannot believe the condition of our apartments. He believes we are too cheap on the rent, but there is a reason for that. If your rent is reasonable, you can get good people with steady incomes and they won't want to leave. If you charge too much, you get people for a year or two, then they move on. We don't like turnover, so when we get tenants, we like to keep them. A little less for rent pays off by having tenants who are long term and take care of the properties as they would their own home. And there is considerable expense when you have to keep renting and re-renting. We love our tenants and they love us. Well, gotta' run back down there and check on the progress. Will take a picture or two. We are in Goshen, staying over at the apartments. We have some work to get done in the next couple weeks. Still working on cleaning out the storage locker, sorting through stuff to take to Brandon's house in Florida in a few weeks. Phaeton Place is in the driveway, but we are getting stuff out of her to take her over to the campground for the next few weeks. The refrigerator is getting replaced, so we thought while we are here we would just get it unloaded so we wouldn't have to rush to do it later. We also are going to take out the recliners and the file cabinet which sit in front of the escape window in the living room. The repair guys are going to appreciate having a clear shot getting the refrigerator out that window and the new one in. They aren't going to have to climb over any furniture. We had what appears to be an air conditioner compressor go out in one of our rental units today so Terry checked it out. We had to call our heating/AC contractor and they will be out on Monday for the repair. It may have to be replaced. Then on Wednesday, one of the duplexes is getting all new windows. The workers will be here at 9 a.m. and out by 4 p.m. with everything done and cleaned up. The tenants are anxious to get their new windows in. The weather has been different here than what we had down south. It is cool in the evenings, requiring jeans if you are out. Mornings are cool and warm up. Then today we had intermittent thundershowers in the afternoon and it got cool again, down to 63*. After that the sun came out and it has gotten hot again. Hmmmm. We had a storm go through last night about 2 a.m. I think. I heard the wind and was going to get up and check it out, but stayed in my nice warm bed instead. Monday my parents are coming here in the afternoon to visit and will stay for supper. We will throw something on the grill and have some veggies. It will be good to see them. My hip is feeling better, but only time will tell if this shot did the trick. I am doing my stretching exercises three times a day and icing it down afterwards. Sure hope it works. What are friends for. . . but to share your troubles with. . .
Well, our friends Janice and Dean have been posting about their troubles with their motorhome engine. At least it hasn't sidelined them for long. We felt so bad for them, we decided to have our own troubles. . . just so we could share their "joy." We left "near" Indianapolis today for a 160 mile run to Goshen/Elkhart. We got to Wabash, which is about half way and several trouble lights lit up on the dash. Terry was driving as I was still nursing my aching hip and generally feeling sorry for myself. The "shift inhibit" light was lit, and sure enough, we were stuck in 2nd gear, running about 2500 rpms. So we limped into the new Wal-Mart with its HUGE parking lot and parked across the curb in front. . . well away from any other cars and right in front of the sign that read "NO RV OR SEMI PARKING." Well, we didn't have any choice, that's for sure. Rather than call Coach-Net, after our dismal experience in February with them, we thought we would start with Tiffin. Tiffin said to call Freightliner, Freightliner said to call Allison and Allison said to call the service center in Fort Wayne, the nearest one. We had not turned off the motorhome because it was in 2nd gear, would not go into neutral and we knew if it stayed that way, we would not be able to start it again. At this point, I went into Wally World and asked to speak to the manager. I told him we had a breakdown and knew they didn't want us there, but we most likely would have to be towed and no telling when that would happen. He was very gracious and said it was no problem and he would alert the night manager. Thanks, Ryan. The service center in Fort Wayne gave us to "Mike" who just happens to be the trainer for Allison transmissions in the motorhome factories. Did he know his stuff? Hah. Imagine calling and 20 minutes later getting someone who KNOWS WHAT HE IS TALKING ABOUT. He told Terry we needed to shut off Phaeton Place and that when he did that, it would default to neutral and would start again, but would be stuck in first gear. He also said he had a tow service well qualified to tow the motorhome, but asked Terry to try something first. He had him read him the trouble codes off the transmission. Then he sent him out under the back end of the coach to find the sensor that was involved. It happened to be handy and LOOSE. Terry tightened it but was sure by the feel of it something was perhaps broken inside. It was the connector that was bad. Terry thought he may have tightened it up enough. We got back in the coach, started it up and started rolling. Mike said if it shifted into second gear, we were good to go. It did and we were! We called Mike back and since we knew the connector needed to be replaced, asked if his center could do it. He said yes, but not sure if it would be today or tomorrow. So we headed for Ft. Wayne, only about an hour away. When we got closer, I called Mike to verify the exit number and we were only 3 miles away. He said, "Well, since you are so close, I will just hang around and fix it when you get here." What a class act. We got there, he came out and fixed it in about 20 minutes. The paperwork took longer. It was $157.00 which I will be turning in as it is under warranty. They don't do Freightliner warranty, but I wasn't going to be picky. I just cannot believe it yet. . . that he walked Terry through the fix over the phone, then stayed put for us and fixed it right then. We gave him a tip and will be putting up a review on rvservicereviews. We made it to Goshen at 4:30, a little late, but not really stressed . . . and I forgot about my hip hurting most of the afternoon. Yay! Well, I'm still hurting. A little bit differently, but it still hurts. Yesterday we went to the hip specialist at OrthoIndy. He is a great doctor and I have seen him before when I thought I was having hip trouble, but it turned out to be sciatica. My sciatica is under control, thanks to accupuncture, but having fallen badly on my hip last December has created new pain. The doctor ordered xrays which I had right there and fortunately, nothing appears to be broken or cracked, which was a surprise/relief to me. The bad news is I have trochanteric bursitis in the hip and he said that can be very difficult to heal. He said the initial treatment would be to inject cortisone, but I had a shot in April and he really didn't like to do it so soon. However, the shot I had in April was with a tiny needle like an insulin syringe and about a half-inch of serum. Terry was watching and said he couldn't believe that little bit would cause me the relief I had for 3-4 weeks. This shot was using a syringe about three-eighths inch in diameter about 2-3 inches long and much more serum than last time. In addition, he pressed around to find the painful spot and when he plunged in that needle, he apparently got right in the middle of it. I really groaned and had to have flinched. His only comment was, "I guess I hit that hot spot, huh?" I think that was what he was hoping, but man, did that ever hurt. It didn't linger, though. As soon as he finished, which was quite quickly, the pain was over. Course, then the aching started. We planned to go to the casino last night, but I was pretty miserable. The doctor also put me on celebrex for one month and I have to ice my hip 3 times a day and do some stretching exercises. He hopes that does the trick. He said this is the most common hip injury and he sees about 10 cases a day. If I still am having trouble in a month, he said to call back and he will order an MRI. If there happens to be some soft tissue damage, then we will look at other options. He said there aren't many surgical options, but depending upon what might be torn, there are some other treatments, including surgery to repair. We are headed north from Indy to Goshen today. We will park Phaeton Place in the drive and move into the house for a few weeks. We have to empty the refrigerator in the motorhome as it is getting replaced at Red Bay in a few weeks. We also will be loading the enclosed trailer for the run to Florida with a bunch of Brandon's stuff. He has a house bigger than our "storage facility" in Goshen, so he will get to go through everything and can toss/keep what he wants. So today we have a travel day. I suspect that will involve mostly Terry behind the wheel so I can prop my leg up. We left Shepherdsville, Kentucky, around 9 a.m. amid and between rain and thundershowers. Just when it looked like it was clear, it started again. But the rain wasn't hard and the wind wasn't blowing. . . just summer rainshowers. I took the helm as we were headed to Louisville and over the bridge and I try to do all the "white knuckle" driving, although Terry has actually been doing some. For a long time it was really stressful for him, but I don't mind. The river was up a little, but I expected flooding, which we did not see. I guess the rains have all been farther north. We did see the east fork of the White River north of Seymour and the fields there were pretty flooded. You could see where the water had been, and it had been quite high. We switched drivers at the first rest stop in Indiana becaue I wanted to take some pictures of the flooding, but there was very little visible from the interstate. I will say that on our travels this month we see so many fewer RV's than normal. In the past, there were so many on the roads all during the day. You didn't drive a mile without seeing a couple coming at you and driving with you. Not so now. I think a lot of people are electing to stay home instead of spending money on fuel and others are staying close to home and not spending time traveling days to get to their destination. The RV dealers' lots are full to the brim with new and used RV's. We are at the GloWood Campground north of Indianapolis. We are here so I can go see the hip specialist on Wednesday. I am anxious to go and find out what is wrong with it. I hope it will just require some rest, but whatever it takes, we will deal with it. Yesterday we left Red Bay at 5:30 a.m. Yes, you read that correctly! Our work in Red Bay was finished. However, we were not happy with the repair done on the shower, so we asked to go to Iuka, Mississippi, to the Waterway Plastics Company. They are a Tiffin affiliated company and make all the front and end caps and the showers. So, Wade, the Tiffin service manager made an appointment for us. They weren't actually open on Friday, but they brought someone in just to do our shower. Robin took care of us and since we were about 25 minutes early and she was already there, she got started early. We were out of there by 9 a.m. which was much quicker than we had expected. We had a list of stuff to be done and all but one item was actually completed. Norcold has decided to change out our refrigerator. I have not had any trouble with it, but cracks are developing in the box at the bottom. The first crack encircles the hinge and it is spidering out from there. I figured they would just slap some tape on it and wait for it to get bigger. But the warranty is up in December, so they said change it out. It has to be ordered and would take 5-7 days so we will take Phaeton Place back down when we go to Florida next month and leave it for the refrigerator to be installed, then we will pick it up on the way home. We drove up the Natchez Trace to Nashville again, my favorite drive. It was beautiful and there were some dark clouds at different places which really made for a pretty landscape. We stopped at one rest area as it started to rain and had lunch. It rained quite hard but it had subsided by the time we were ready to leave. We ended up driving all the way to Shepherdsville, Kentucky, as campgrounds along the way were either full or not too good for a 40'er with 4 slides. We are in Grandma's RV Park just off I-65. We were going to leave tomorrow, but it is quite nice here and we have decided to stay another day and head north to Indianapolis on Monday. There is a lot of flooding in central Indiana around Columbus and they were expecting more rain. We thought we'd give the weather time to clear before make that run. My appointment with the hip doctor is Wednesday, but we will have to pick up mail and will probably run some errands in Indy. We will be staying at the Glo-Wood campground north of Indy, near Fortville. In other news, son Brandon has bought a house in Melbourne, Florida. He closed on it yesterday. We have rejoiced with our kids on their first home purchases. We know how important owning their own home is to them and it is quite satisfying as parents to see our children realize their dreams. Congratulations to both Jocelyn and Brandon for reaching that milestone! Yes, Phaeton Place was born in Red Bay, Alabama, home of Tiffin Motorhomes. We are here for her yearly checkup and most of the items on our list were addressed today. Still have a couple things left to do and it looks like we may be getting a new refrigerator. The box is cracking on ours; looks like stress fractures and since we have the extended warranty, better to get it replaced now. There are still building motorhomes here, although we have heard they are on a reduced schedule, but the service bay techs are busy working on coaches, so that is good. Today we just hung around the lounge as it was probably in the 90's here and we thought the dogs would be more comfortable in the air conditioning. They both got baths last night, so that meant Neal has been mad at me all day. But he has to appreciate being more pleasantly fragranced today than yesterday. Ho ho. We sat and talked with other Tiffin owners and the general feeling here is always upbeat. I guess that's because we want the techs to do a good job, so we try and keep things "light." I got my kitchen worked on. My cabinets were "falling." A support block underneath the kitchen cabinets had broken and the cabinets started to sag. Terry was sure he could fix it, but he was afraid of breaking the solid surface countertop. At least if the tech broke it, he would have it to fix. It appears he got the job done without damaging the counter. 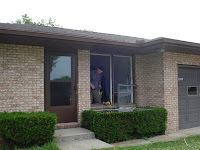 We also had 3 windows replaced and some other little stuff fixed. You just can't put this much on a chassis and run it down the road without something jiggling loose. We will probably be here for another couple days. The Pace-Stephens reunion was last Saturday. . . and it was another great time. There were 41 who signed the book this year, but we know of at least ONE (right Uncle Bob?) who didn't sign. We did vote to try and get a building next year which is air conditioned. The community building just up the hill may be the site next year if it hasn't already been scheduled. It would be nice to have it inside as it has been really hot the last couple years and we are hoping more people will get out to come if they know they will be comfortable. We have some friends who are out in the Cape Hatteras area volunteering at a wildlife habitat and we had thought about going out there to visit when we get done here. Many of you know, however, that I fell last December and injured my hip. I struggled with it until April when my doctor gave me a cortisone shot. It isn't any better and it has been getting much worse. Last week on the boat, I hurt it again and yesterday I did the same. I try very hard not to hurt it, but a little trip or mis-step sends pain shooting through the hip and down the leg. It takes about 12 hours and lots of motrin to get to walk again with only a slight limp. I do have an appointment next week with my hip specialist in Indianapolis I had seen before. I don't know what he will find, but something has to be wrong. It may mean a change in our fall plans depending upon what he finds and what he recommends as a course of treatment. But whatever, it will be a temporary diversion and then we will continue on our way. Note: This post was made June 6, but since I didn't have internet access at the lake, I had to wait until today to post. Yesterday we left J. Percy Priest Lake at Nashville, but not before I got a couple pictures of the lake. Really pretty, but it was windy and very rough the days we were there. We drove around Nashville and picked up the Natchez Trace Parkway for the run down to Bay Springs Lake (Mississippi) on the Tenn-Tom Waterway—that’s the Tennessee Tombigbee. I have pictures of this waterway while it was under construction. The first year we were married, 1971, Terry’s parents brought us down to Mississippi for Thanksgiving for me to meet the relatives. Terry and I went exploring on our own and we came over to where they were digging this huge ditch. Someday I will drag out those old pictures and show them side by side with the current ones. We stay at the Piney Grove Campground when we are in the area as it is the closest campground to the relatives, although it is some 30 miles away. It is a comfortable campground, a COE park, so we camp quite cheaply. We have water and 50Amp electric, but no sewer. Today we ran into Booneville, Mississippi, to Wal-Mart for some supplies and stopped off to see Terry’s cousin Shirley briefly. It is always good to see her and we also got to see Preston, her grandson. Since he won’t be at the reunion tomorrow, it was good we stopped in and visited with him. We are back at the camp now and it looks like we are going to take a nap. Hah. That’s what you get to do when you retire. . . NOTHING, if it suits your fancy! We are in Nashville, arriving yesterday afternoon at the J. Percy Priest Lake, a reservoir of about 14,500 acres. It is a very nice campground, very heavily wooded, so none of our satellite systems work, but. . . hey, we like to rough it sometimes. Hah. Last evening we drove downtown into Nashville and went by the LP stadium. This week is some sort of music festival and they are having some big name entertainment, but we are leaving tomorrow, headed to the family reunion, so we won't get in on that. We also went down to Centennial Park and I got pictures of the Parthenon, a full-scale replica of the one in Greece. It even has a 42' statue of the goddess Athena, like the original. It is quite impressive. The building houses Nashville's art museum and was built in 1897 in celebration of the town's centennial. We will come back another time and do some browsing there. Today we shopped at Opry Mills. Found a few things we couldn't do without and then it was laundry time. Nothing too exciting about that, but when you are without full hookups for 2 weeks, it kind of stacks up. Terry left me at the laundromat and went back to feed the dogs their supper, then came back to get me. We have been sitting outside in the breeze until just a few minutes ago. It is very pleasant here and definitely a place to return to. It is full, however, and the hosts tell us it is filled to capacity most every night. I guess that is because of its proximity to Nashville and the reasonable rates, since it is an Army COE park. The other parks closer into town charge $35-$50 a night. This shows exactly what these people were doing on the lake. They were flipping way high up in the air. They are strapped into the chair and wear helmets and lifejackets. Now I used to ski in a ski show, but I would not do this. I might try the chair, but no flips! A good day on the lake. Yesterday and today were supposed to be wrought with thunderstorms all day. Yesterday we worked on the jetski, trying to get it running a little better. We finally got that accomplished and fortunately didn't have any nasty weather. It did start lightning later in the evening, but nothing happened. I awoke about 2:30 a.m. thinking I had heard thunder. The dogs were sleeping in their pen and hadn't heard anything, but I started to hear a couple sprinkles on the roof. I knew we had not set our lawn chairs inside and so I went outside and put them both into a basement hatch. About a half hour later I heard Bailey dancing around and I got up and let him out of the pen. It was lightning and I could see it through the front curtains and Bailey doesn't like that, but he was content to come back to the bedroom and lay down on the floor beside my side of the bed. Neal never did wake up and while it did sprinkle some, there was no storm or big deluge. Today was overcast all morning, but we decided to head out on the boat this morning and go over to Sulphur Creek for lunch. The first picture is our boat in its slip and the second is backing out of our slip behind the Sunset Dock Marina. We weren't even away from the idle zone when we saw a boat with a family and the two young boys were taking turns paddling. We pulled up within talking distance and asked if they needed help. They did; their boat wouldn't start. We asked if we could tow them into the dock. They weren't that far away, but it still would have been a couple hours before they could have gotten in. . . and if weather set in, they would never get there. So we tied them on and pulled them in. They were very appreciative and offered to pay, but I would never take money from someone I helped. I told them no, just offer the same to us if they find us stranded! The lake is so deserted right now and the marinas are hurting because of the high fuel prices. People are not boating. One of my fears was that we would get out on the lake, break down, and no one would be there to help us; so I am glad we were able to help this family. We rode on out into what I call the "big water" and made it over to Sulphur Creek for lunch. We were the only ones in there eating, but while we were there, two other families came in. No one in the shops either. I really hate to see this because one thing you need if you are on the lake are services of some kind. . . primarily fuel, but also food and shopping. That's what makes a day on the lake so much fun. We did a lot of riding around to other docks we used to frequent when the kids were with us. On the way to Holly Creek, we saw 15 houseboats all docked together. They were so close, you could walk across the back ends of the boats. They had a couple signs that indicated it might be a school reunion, but at the dock, they said it was a church group. I kind of doubt that was the church group because one of the banners said, "Party Animals." Ho ho. The skies continued to look ominous the entire time we were out, with only a bit of sunshine, but we never did have inclement weather. On our way back to the dock, we saw a couple of the ski show participants in their "air chairs." It's hard to get a picture when you are moving in opposite directions. We came in and got the boat in the slip and all buttoned up, all the while listening to thunder and watching some pretty dark clouds. But here we sit some 3 hours later and we still haven't had any rain or storms. I'm not complaining, just making an obversation. We are in for the evening now. For the first time today, the sun is out, very brightly and it has cooled off a little. A nice evening to sit outside.